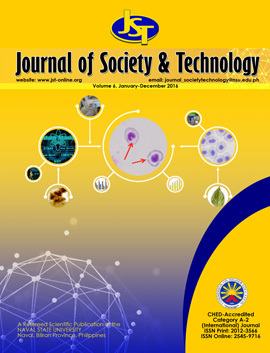 The Journal of Society and Technology (JST) is a peer-reviewed international publication of the Naval State University (NSU), Naval, Biliran, Philippines. The Journal of Society and Technology (JST) is a peer-reviewed publication about original research papers and review articles that address issues and concerns in society and technology. Articles related to society cover education, human resource management, health and safety, business and entrepreneurship, risk management, and research findings related to the interaction of human and the environment. The journal also welcomes articles related to agriculture, food technology, engineering, information and communication technology, and innovations in other fields.